Thank God It’s Curd Day! A typical Friday for the world class, award-winning, artisan cheese maker Tony Hook begins at 3.30 in the morning. Most days are an early start for him, but Fridays are earliest of all. He and his wife Julie Hook, an award-winning cheese maker in her own right (and the only woman to have ever won the World Championship Cheese Award), have been making cheese together since 1976. 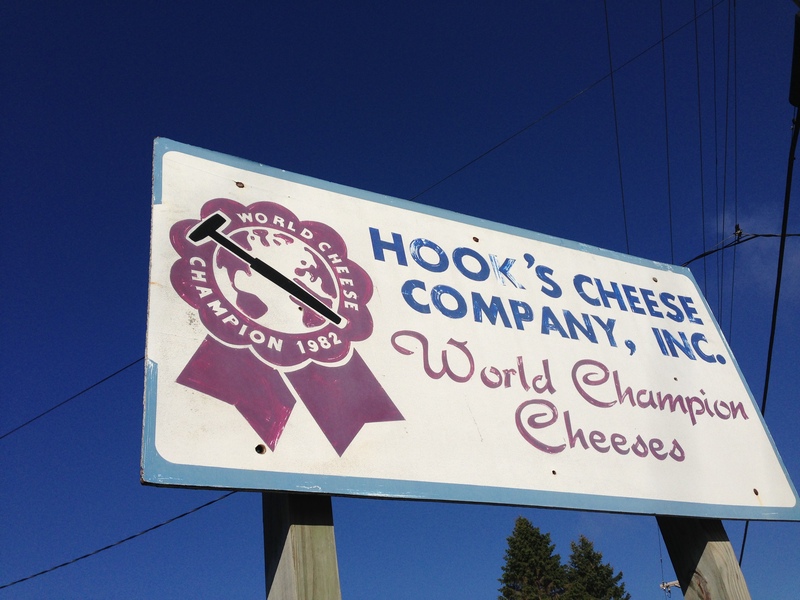 Friday is the one day that Hook’s Cheese is open to the public for cheese sales, and locals in particular queue up to buy their weekly fix of fresh cheese curds. 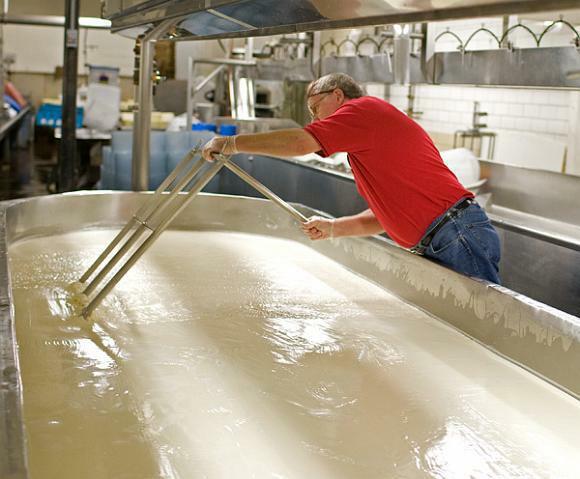 Stepping through the factory door, the heady aroma of fresh curds and whey about to become the next batch of Hook’s creamy Blue Paradise fills the room. Making more than 30 different types of cheese, Hook’s is renowned for its unique, “crystalized” aged cheddars, its Colby and its blue cheeses. Since first releasing their 15-year aged cheddar in 2009, Hook’s has become the darling of cheese aficionados and foodies across the nation. (Case in point – this rare, exquisite cheese can be purchased for $75/pound online from the Cheese Store of Beverly Hills). Now grandparents, the Hooks have thought a lot about retiring, but the most the couple has been able to do, is cut back a few hours. Having gone from a seven-days-a-week operation to a six-day one, in recent years, they have become snowbirds, traveling to warmer climes for their annual vacation. Meanwhile Tony says he cannot stop coming up with new recipes. Humble and welcoming, he is a man who simply loves what he does. Eager to share his knowledge, loyalty and consistency are two of the keys to Hook’s success. Keeping it in the family, relatives run the day to day business. They have been buying their milk from the same Wisconsin farmers since they began and are now dealing with the next generation of dairy famers. Tony’s latest creation, the cheekily named, Ewe Calf to be Kidding, made a splash at the 2013 American Cheese Society. Placing a second in its category, the cheese is a highly unusual mixed blue, made from sheep, cow and goat’s milk (hence its name). Indeed, according to Tony it was more than two years of experimenting, after copywriting the name, Ewe Calf to Be Kidding that he got the balance of the cheese just right. Hook’s Cheese is one of the jewels in Mineral Point’s crown. 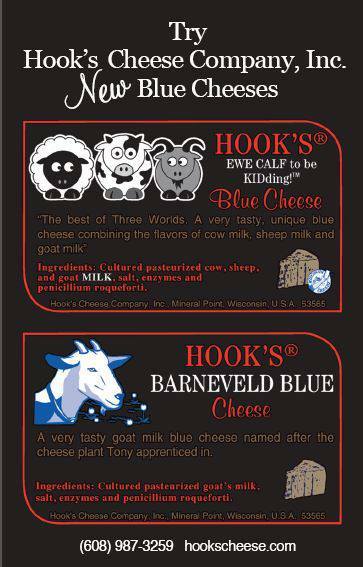 Long may Tony Hook be dreaming up and creating wonderful cheeses for us all. This entry was posted in Food, People and tagged Hook's Cheese. Bookmark the permalink.